I am so glad I decided to purchase this book instead of waiting to see if I might have won it. I kept seeing it on others bloggers blogs-I could not resist! Molly, an unassuming young woman who had the unfortunate habit of doing daily tasks for her somewhat boring job in Florida at the exact same time wearing the exact same coat and shoes every day is accused of robbing a bank. The police figure finally she is innocent but she keeps getting threatened in various ways. 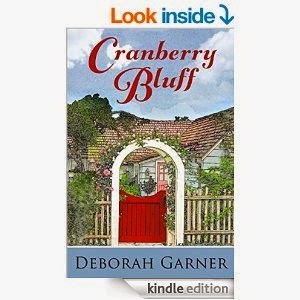 She picks up and moves to Cranberry Cove in California to take over her Aunt Mary's Bed & Breakfast. What ultimately happens there when several "guests" appear will keep you riveted. The twists and turns keep coming at you. The ending and who actually done it--well 2 mysteries for the price of one! By the way while your mouth is watering as the guests are served various food items--and you also love cranberry's like I do--there are recipes for all of them at the end of the book!! I love books that enrich the experience by adding in real-life usable things. Recipes in the back is a big selling point! This is one of my favorite book covers, so pretty. I love Cranberry too, what a great extra idea for a fiction book. It sounds like a great read. I can only imagine what the Inn guests were up to. I can't wait to read it. 2 surprises in one is a great bonus for a book. I'm glad she was eventually found innocent, but am curious now as to what the twists could be! I don't usually find that titles grab my interest but this one did. I will have to pick this up to get the recipes! This looks like a great story. Perhaps I can read it over the school break! That looks like another great read. The ending of the summary makes me want to go out and get the book now. How nice for a book like that to also include recipes! Sounds like a funny book with a mystery twist. This sounds like a great read! I love books with recipes! Thanks for sharing this book review. I enjoy cooking so recipes are appealing to me in books. Thanks. Now this is a book that looks right up my alley! I love it when you buy a book (before seeing if you won it or received it some other way) and it turns out to be more than you even bargained for. This sounds great! I love that the author is a travel writer as well. I can see myself getting into this book! I love that this book has so many plot twists. It keeps the reader engaged that way. Sounds like a good book to read! Hopefully I'll get a bit more time after the holidays! Thanks! This sounds like an interesting read. It outside my normal genre but I think I may give it a try! I love reading your reviews and book recommendations. I always find a new good read on your blog! Love that it's based around a bed and breakfast! A fun novel with recipes at the end? That is so cool!